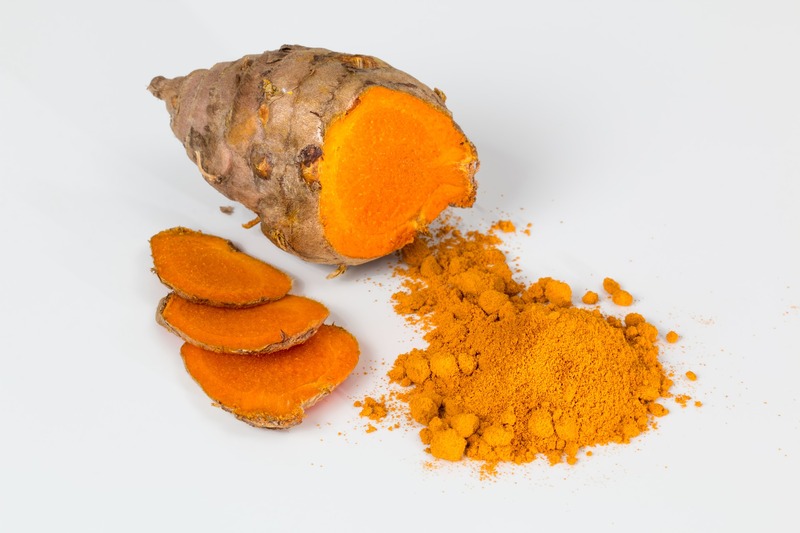 Today I would like to talk about one of my favorite superfood and spice – TURMERIC. Turmeric root comes from Curcuma Longa plant and has brown skin with orange flash with similar to ginger flavor. It has been widely used in traditional Indian cooking as a warm and bitter spice that gives yellow color to carry and mustard as well as in Ayurvedic and Chinese medicine for centuries as an herbal treatment for internal and external illnesses. Turmeric’s anti-inflammatory, antiviral, antioxidant, anti-cancer and cholesterol lowering properties had sparked a lot of interest in research. There are millions of laboratory and clinical studies of turmeric and its benefits on human’s health that allowed more and more of its implication as medicinal herb in Western Medicine for prevention and treatment of variety of chronic diseases. What makes Turmeric so super-powerful? Turmeric improves gastro-intestinal health. It increases mucin secretion and thus acts as gastroprotectant against stomach irritants. Curcumin has some antispasmodic, anti-flatulent activities and enhances intestinal enzymes such as lipase, sucrase and maltase activity. Due to its anti-inflammatory properties, turmeric is equally compared to pharmaceutical’s painkillers and gains its name as “Natural Ibuprofen”. Curcumin has been shown to reduce the TNF (tissue necrosis factor) induced expression, down-regulate cyclooxigenase-2 and nitric oxide synthetase that are represent different inflammation pathways. The antioxidant effect of turmeric was reported as early as 1975. It acts as a scavenger of free radicals and can protect hemoglobin from oxidation. Antioxidant action of Curcumin reached by maintaining the activities of antioxidant enzymes like superoxide dismutase, catalase and glutathione peroxidase in our cells. It reduces cholesterol level, particularly, low density and very low density lipoproteins (LDL and VLDL) due to enhancing pancreatic and intestinal lipase activity. In addition, stimulation of bile production by turmeric expedites elimination of cholesterol from the body and increase fat metabolism. Anti-carcinogenic effect. Curcumin acts as a potent cancer-fighting compound due to various mechanisms. It induces apoptosis (cell death), inhibits proliferation (cell growth) and prevents mutation. Stop progressive cognitive deterioration by decreasing Beta-amyloid plaques and delaying degradation of neurons. Antibacterial activity. It suppresses growth of several bacteria like Streptococcus, Staphylococcus, and Lactobacillus and prevents growth of Helicobacter Pylori. Antiviral (for example: Epstein-Barr virus) and anti-fungal effect. All these excellent properties of turmeric that were known for thousands of years make Turmeric to be called “nutraceutical”. Because turmeric in high dose has medicinal property, it can have interactions with other drugs. Consult your health care provider before you start taking turmeric-containing supplements. Blood-thinning Medications — Turmeric can make the effects of these drugs stronger, raising the risk of bleeding. Drugs that reduce stomach acid — Turmeric may interfere with the action of these drugs, increasing the production of stomach acid. What conditions or diseases can Turmeric help with? The list is endless. Basically, any degenerative diseases (chronic conditions and disorders that caused by toxins, diet and lifestyle) can be prevented or reversed by implementing few changes in your life along with use of powerful medicinal food and supplements that contain one. A powerful supplement, containing turmeric, that I discovered recently and I would like to share with you is Protandim. Protandim is a nutraceutical supplement that reduces oxidative stress that caused by 40% in 30 days and by 70% in 120 days. It activates the body’s own enzymes to fight free radicals that are leading cause of illnesses in America. Decreasing oxidative stress we lower chance to develop any chronic, degenerative diseases, cancers and slow aging process. What is in Protandim? Besides Turmeric that we already discussed here, there are four other powerful ancient Chinese and Indian herbs that synergistically work together and enhance each other’s benefits: Green tea, Ashwagandha, Milk Thistle and Bacopa. Protandim has been on a market for quiet sometime and gain a lot of attention from research and media. If you would like to start your natural prevention now, order Protandim here. If you want to learn how to add turmeric to your food, keep reading. Try and play around with it but don’t forget to add black paper for turmeric’s better digestibility and absorption. Today I would like to share one of my favorite recipes that perfect for the upcoming cold season.